Welcome to the 2019 Sterling Gym Summer Programs! It's going to be a great, fun-filled Summer at Sterling Gym, with lots of new faces, new spaces, and expanded programs to keep your kids fit! Choose your week, 3-day camp or 5-day camp, and choose an activity to focus on - Gymnastics, Pre-school, or one of our specialty camps: Cheering, Circus Arts, Ninja Challenge, Dance, or Martial Arts. 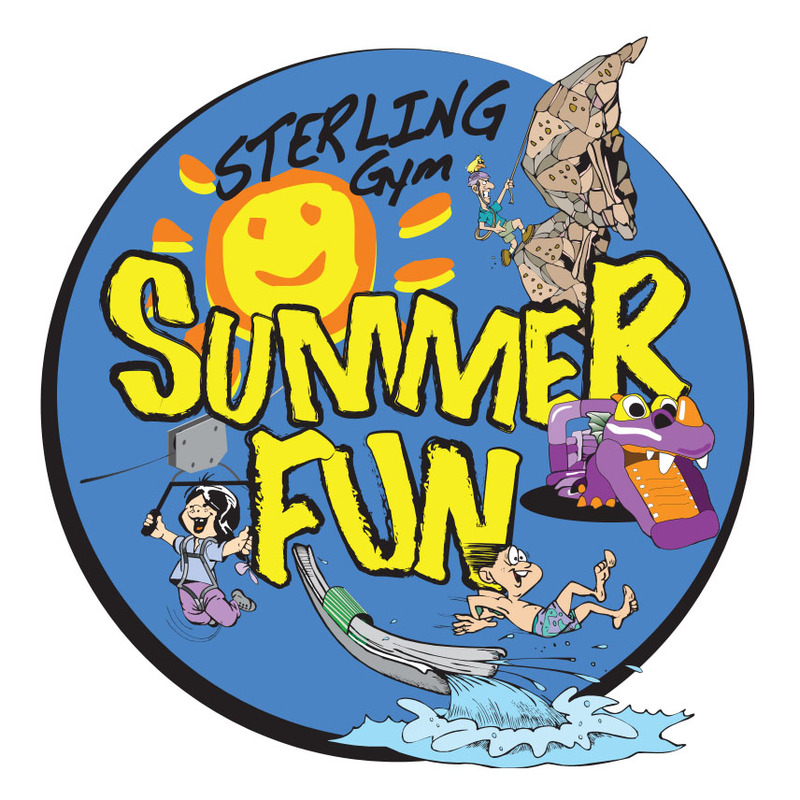 All campers get to use all the great activities Sterling Gym has to offer, such as our pool, awesome water slide, rock wall, or high speed zip line! We also have air-conditioned activity areas, available lunches, extended hours, and family discounts! Sterling Gym keeps getting better, year after year, and has been awarded the Best Gymnastics School in the area again! Our Summer Camp Program operates on a weekly basis, starting June 25th and ending August 17th. Each day starts at 9:00 am and ends at 3:00 pm (extended hours available from 7:30 am to 5:30 pm). In the morning, campers will be instructed on each of the Olympic events, including use of the training foam pit, tumbletraks, trampolines, and mini-trampolines, as well as participating in numerous other activities including our rock climbling wall. In addition to the morning gymnastics classes and activities, campers will have a rotation in the pool or water slide to cool off (weather permitting). In the afternoon, campers will engage in a variety of sports activities including volleyball, kickball, as well as non-competitive activities such as a trip down the 300' zip-line, scavenger hunts, or splashing down our water-slide. Please note that all outdoor activities are subject to weather conditions. Campers will finish the day with an open workout where they may choose to practice their gymnastics skills, swim, or choose from a special daily activity. Any student who has completed Kindergarten is eligible to participate in the Sterling Academy of Gymnastics Full Day Camp. The child must be at least 5 1/2 years of age. Sterling Gym is now offering 3-day weeks in addition to the full week camps! This camp is limited to full day gymnastics camp only. Days are Monday, Tuesday, and Wednesday only, no discounts apply, and days may not be changed. This exciting camp is for children ages 4 to 5-1/2. The camp will run from 9:00 am to 12:00 pm (half-day) or 9:00 am to 3:00 pm (full day). Campers will have the opportunity to do gymnastics, arts and crafts, swim in the supervised pool, have story time, and participate in outdoor activities. Our Pre-School gym and function rooms are air conditioned for comfort! The staff ratio for this camp is 5:1 and space is limited. All campers should bring a healthy snack with them in addition to the proper attire requirements listed in the brochure and on this website. Full day campers have the option of purchasing a lunch from Cartwheels Cafe, or may bring their own lunch. Sterling Gym is now offering 3-day weeks in addition to the full week camps! This camp is limited to full day Jungle Gym camp only. Days are Monday, Tuesday, and Wednesday only, no discounts apply, and days may not be changed. This camp will feature many of the popular activities incorporated in our gymnastics camp, such as water slide, pool, and zip line, in addition to the uniqueness of learning all aspects of dance including Hip Hop, along with gymnastics. At the end of each week, parents are invited to watch the Dance Showcase performed by the campers! Kids will get to learn routines from their favorite movies and tv shows along with today's hottest bands. Enrollment is limited to 20 students per week, ages 6+ yrs. only. Tuition is $275 per week. This camp incorporates the high flying skills of the circus including the trapeze, tight rope, and silks. Campers will be able to use all the other aspects of camp including the pool, waterslide, zip line, and much more. Must be at least 8 years old for this program. Sterling Martial Arts camp will follow the same schedule as the full day campers, with more focus on shotokan karate, self defense, and radKIDS techniques. This popular camp is a fun and exciting experience for both girls and boys. The focus maintains tumbling skills specific to cheerleading aspects of gymnastics and dance. In addition to cheerleading classes, students will also enjoy all activities incorporated in our gymnastics camp. Our newest camp incorporates the obstacles seen on the popular TV show, and challenges kids to test their speed, strength and agility against all sorts of scenarios. From tarzan ropes to pinball blocks and just about everything in between, you can test your strength on the ultimate obstacle course. Note: Weekly themes will be incorporated into each weeks' activities and campers will be instructed at the beginning of each week on how they will participate in these new and exciting additions to camp. When your child comes to camp they should wear appropriate clothing - no baggy clothing, no jewelry, no pockets, zippers, belts, or buckles. A bag lunch is required for every child and a snack for the morning break if desired (fruit is strongly suggested). Lunch programs are now available for Summer camp students. Cartwheels Cafe provides daily lunches including drink, snack, and dessert for only $6 per day. Menus are available in our lobby at the beginning of each week. Children should also bring sneakers to play outside, swim suits, sunscreen, and towels. Please leave all jewelry and valuables at home! Tuition for Summer Camp is $275 per week. For campers attending more than one week, and/ or families with multiple children enrolled, there is a discount for each additional week or each additional child. This differs slightly from our school year calendar. Discounts may not be combined. For students not currently enrolled in Sterling Gym, there is a non-refundable membership fee of $30 per student. All camp tuition must be paid in full two weeks prior to selected camp week. A $10.00 late fee will apply to all camp payments received less than 2 weeks prior to your scheduled camp week. Tuition for Pre-School Half Day Camp is $140.00 per week. The Pre-School Full Day Camp is $275 per week. The same discounts apply as above. Tuition for 3-day Camp is $175 per week, no discounts apply. Days are Monday, Tuesday, Wednesday only. Days may not be changed. These sessions apply to gymnastics full day camp only. For students not currently enrolled in Sterling Academy of Gymnastics, there is a membership fee of $30 per child. Children must be at least 4 years of age to attend the Pre-School Camp or at least 5-1/2 years of age to attend the Full Day Camp. All Full Day campers must also have completed Kindergarten. Any children with peanut or other serious allergies must inform Sterling Gym of any allergies prior to participating in any Sterling Gym programs. A non-refundable deposit of $100.00 per child per week is required to secure a reservation and the balance of the tuition is due 2 weeks prior to each camp week. Registration is on a first come / first serve basis and space is limited. All 2019 Summer program applications are completed online by using the link below. Online registration is available in our Parent Portal. The Director of our Summer Camp is Jason Lewenczuk. Jay holds a B.S. in Business Management from Springfield College, and has over 20 years experience as a coach and counselor. Our Summer time staff features enthusiastic members which include all our permanent staff members as well as some new faces. This combination promises to provide another fun-filled Summer program. Parents are required to complete important registration, medical and immunization forms prior to students attending camp, or classes. Without this information, we cannot allow any child to participate in any activities.